The past two days, we had a planning time with our team where we planned for the spring semester. With all of this being so new, it was a great time to connect with our team as well as get a big overview of what is happening ministry-wise on our campuses here in NC. We started with a time of thanking the Lord for all the things that He has done this semester. 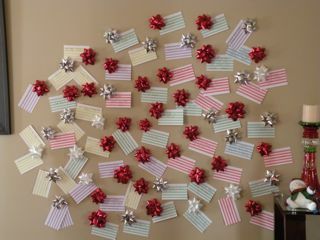 This is a picture of our thankfulness wall. Pretty colors, right? Then we talked about the reality of where our campuses are now at in ministry and our dreams for where we would like to see them by the end of the next semester. While we have over 35 schools in our scope, there are 11 schools where we either have a ministry of some kind going on currently, or we have a key contact at that school and are giving it some focus. It was really exciting to think of the potential that exists for growth at each of these schools and the doors that the Lord has opened. But all of this during planning, along with some major things that have happened this week in the lives of people I know that have left my heart heavy, have gotten me thinking about all the things I am thankful for. While this is by no means a comprehensive list, these are a few of the things that have come to light this week. A daughter who is a true delight and such a ham! She always makes me laugh and it is so fun to see her learning and growing every day. I know that not everyone is able to have a child, so I be no means take this blessing lightly. 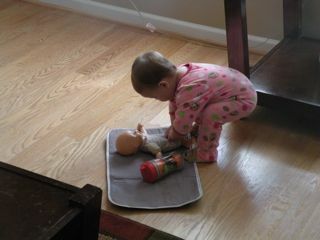 This picture shows her with her doll (whom she LOVES!!) that she loves to be “mommy” to by changing her, feeding her, etc. She isn’t always the most gentle with her so thank goodness its not a real baby! Ed – I am so grateful for how he leads our family, how he can admit when he screws up, and how is constantly desiring to become more like Christ and follow Him in everything. While marriage isn’t always easy and I don’t know why he puts up with me and my mood swings and flaws, I am grateful he does and how God uses marriage to refine us. Our house, town, and new location. I love where we live!! We are a few blocks from town and many amenities, but yet we feel like we are in the country. Here is even a picture of what I saw a few weeks ago. 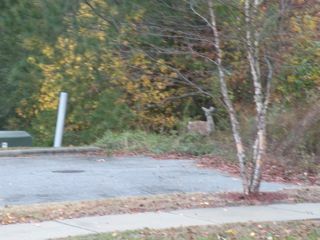 Since this picture was taken, we have seen them almost daily walking around our house. We found out that our neighbor is feeding them, which we don’t mind!! Our town is small, but when you don’t grow up here and know everyone, its not so bad! Our team. We have really been getting to know them better and love hanging out with them. Freedom. Freedom to share the Gospel (even though we see this becoming less and less, even in America). Freedom to move around and go about as we please. Freedom to share what is going on in our lives with others and say what we would like. This is something that I have really been pondering lately. I don’t think many people in America are aware of the persecution that many people face even today in the world for sharing about Christ. When this persecution involves our friends, it is taken to a whole new level. Provision. We are so thankful for our ministry partners, and when we fill up with gas, or buy things at the store, or even buy ministry supplies, we are reminded of their sacrifice and faithfulness in giving so that we can be ministers to college students and faculty. The Lord is so good to provide through people who believe in what we do. Christmas. I LOVE this time of the year. Focusing on Christ and his birth. Christmas lights – which Kinsley LOVES and always says “wow” and “woa” to. Christmas parades. Decorations. Time with family. Christmas cards. I just love it!! 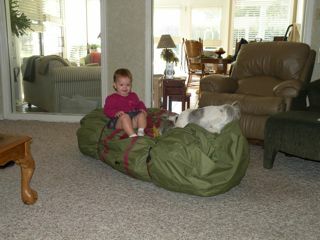 Here is Kinsley helping to put up my mom’s Christmas tree, along with Bella, her partner in crime. While there is lots more to list, just wanted you to know a few things that have been on my heart and mind lately. Thanks for joining with me on my journey of thankfulness.